The rooster bowl, the ceramic kitchenware known for a distinctive chicken pattern on its side, is a major product of Lampang Province in northern Thailand that has brought financial stability to many locals thanks to its popularity. Over 60 years ago, a rooster bowl factory was founded by Chinese immigrants in Lampang. The white clay bowl, with a rooster, peony flower and banana tree hand-painted on its side, sold well and has become widely used in restaurants and Thai-Chinese households. Along the way, rooster-bowl production developed into a major industry in Lampang, already host to pottery and ceramic factories due to the availability of kaolinite. Today, Lampang has about 200 factories that make rooster bowls. The rooster bowl has become a symbol of the area, and chicken patterns adorn the street signs, bridges and various major structures in the province. Juthamas Kaewthong, 41, owns Kaewthong Ceramic Factory in Lampang's Koh Ka district. Five years ago, she opened the small factory to make rooster bowls with lids. Previously, Juthamas had been a ceramic kitchenware distributor. But she decided to make the bowls with lids on her own as they had sold most and been in short supply. "I decided to open my own factory with initial capital of about 700,000 baht ($22,400) in 2014. I have gotten a return on investment since the first year," she said. Juthamas not only sells the clay bowls at her shop but also supplies them to other ceramic shops nationwide. Thanks to her business, she now can afford to take care of her family, including her parents, she said. Many ceramic shops line the major road in Lampang that leads to the neighboring province of Chiang Mai. While they display various ceramics products, rooster bowls in various designs and patterns occupy the most prominent space there. Shop owners say tourists who hop in for shopping, whether Thai or foreign, always opt for rooster bowls as if they are "must-buy items," as they are popular and make good souvenirs from Lampang. Surasith Kraibuttra, 49, who plans to open a noodle shop in Chiang Mai, says he and his wife will pick rooster bowls as kitchenware for the shop as the bowls go well with its interior, which consists of wood and bare steel. Moreover, because people often take photos of their food served in restaurants, he thinks rooster bowls would impress customers and set his noodle shop apart from the rest. Surasith plans to buy about 200 rooster bowls for use at his new noodle shop. The price of a rooster bowl ranges from 10 baht for a small bowl to more than 300 baht depending on size, paints and production quality. Dhanabadee Ceramic Group Co. runs a factory in Lampang that is one of the first rooster bowl manufacturing plants in Thailand. Founded by Chinese immigrants, the company is now run by second-generation members of the founding family. The factory employs about 200 people and its products are exported to some 70 countries, including China, Japan and the United States. 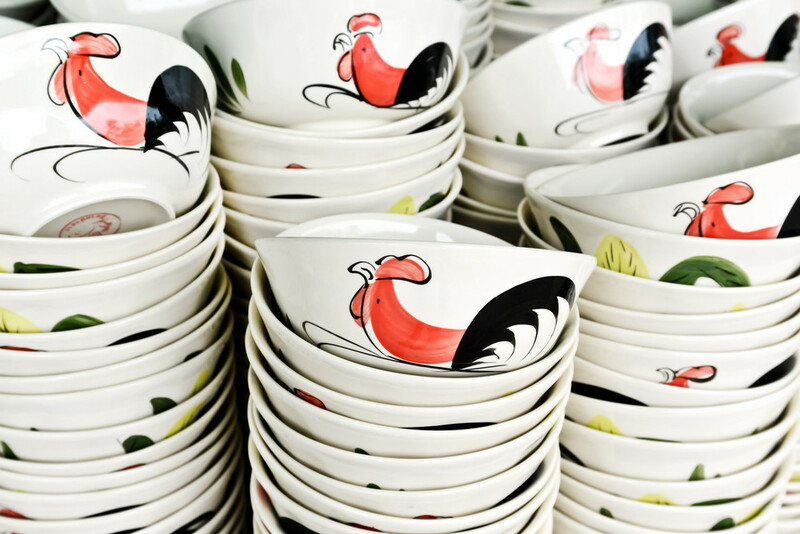 At a museum attached to the factory, a tour guide touted the virtue exemplified by the rooster painted on the bowl, saying chicken is a symbol of hard-working men and women. "The picture of a chicken or rooster on the side of the bowl has inspired everyone to work hard and diligent. Every time people eat food from rooster bowls, they are inspired to keep their spirit and being diligent the same way chickens are," the guide said.